Protect your screen from scratch,scuff,damage.A essential thing for your Samsung. - This kind of screen protector is 99% High Definition Clarity, 99% light transmittance, keeps the bright and colorful image quality. First, you should use the wet and dry wipe we provided to make the screen clean, ensure no other things left such as dust, air. If not, the adhesive and the response sensitivity will be not so good. Second, DON'T press it if you haven't aimed at your device totally, specially the position of screen, both top and bottom. The glue is so strong, if you finished it but tear it up or try it over twice, the adhesive will be not so good. What's worse, it will cause a crack due to the strong glue, because it is hard to be torn up. Finally, once you have installed it, press the edge of the screen protector gently, let it to be adhere to the screen completely. ✅[HD] FULL COVERAGE - Curved Fit Made for Samsung Galaxy S9 Super display including Curved Sides. ✅EASY TO INSTALL - Latest tech plus new method, we are committed to make screen protector installation a easier thing. Strictly following the instructions to operate and you can apply a perfect screen protector easily (Dust and Bubble Free). ✅ULTIMATE PROTECTION - Special scratch-resistant coating to protect your device from daily scratches, dust, scrapes, and normal signs of wear, it is strong enough to protect your screen from drops. 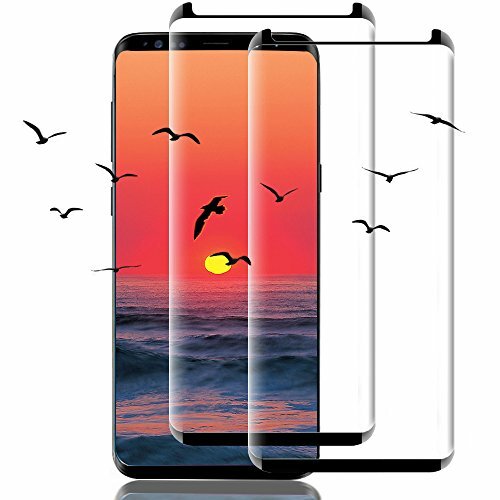 ✅HIGHLY TRANSPARENT - This kind of screen protector is 99% High Definition Clarity, 99% light transmittance, keeps the bright and colorful image quality. ✅TOUCH SENSITIVITY - The ultra thin screen protector promises full compatibility with touchscreen sensitivity and preserves your phone's original high-response touch feeling without any interference, can maintain the touch feature for your Samsung Galaxy S9. If you have any questions about this product by my-handy-design, contact us by completing and submitting the form below. If you are looking for a specif part number, please include it with your message.